April began with Palm Sunday this year, and Easter Sunday falls on the eighth day. In so many ways, this brings us Christians back to our roots. On Easter, God did not merely resuscitate a corpse. That would have been merely miraculous. Nor did he merely vindicate His Son. That would have been merely triumphant. No, on Easter Sunday we mark the moment when he who sat upon the throne said, “Behold, I make all things new” (Revelation 21:5). We are living in that moment. We are already living in a day when heaven and earth are full of His glory. Christ is risen. He has been vindicated. He reigns triumphant. But the Good News is even better than all of that. Through his rising he has glorified our poor flesh and taken it to heaven. Through our share in his death and resurrection, we have become “partakers of the divine nature” (2 Peter 1:4). Through the sacraments he empowers us to live that life, not just when we go to heaven, but even now. Those early Fathers loved the Easter season because it was the time the Church admitted new members through the sacraments of initiation. 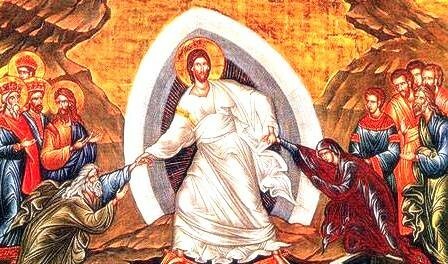 Easter was the season of a special preaching the Church calls mystagogy: the explication of the mysteries. Through the grace of the sacraments, Christians receive eyes to see the “new heaven and new earth” (Revelation 21:3). A new Christian, newly healed and unaccustomed to such vision, might look out and say, “I see men; but they look like trees, walking” (see Mark 8:24). But the mystagogical teaching of the Fathers leads us to see the world aright, as God has created it to be, and as He has redeemed it—as He is redeeming it even today. Mystagogy leads us to see God’s new world awash in the “river of the water of life, bright as crystal, flowing from the throne of God and of the Lamb” (Revelation 22:1). Mystagogy reveals the “hidden manna” of the Holy Eucharist. By the light of the Easter Candle we can see so much we could not otherwise apprehend, because we are looking now with eyes of faith. Let’s live this season as our most ancient ancestors did. Let’s make it a moment of celebration of the mysteries — the sacraments Christ instituted for us and entrusted to the Church. Let’s live Easter in prayerful study of the Scriptures, in the company of the Fathers. Let us come to see this “new world”—the Church and her sacraments—for all that God has made it to be. The ardor of Easter is different from the rigors of Lent. It is pure joy, pure praise, a pure stream of Alleluia and Gloria flowing at last in a life we had laid waste. You are good to share this moment of joy with me and my colleagues at the St. Paul Center. I promise you our prayers, on the Eighth Day and beyond. For our mission is mystagogy—or, as I put it in the title of a book for the Easter season, Living the Mysteries.